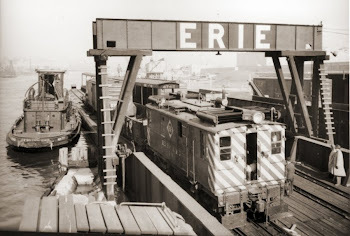 Small real estate property, simple yet entertaining trackage, realistic operation and opportunities to scractchbuild and superdetail structures and rolling stocks are the most interesting features Erie Harlem Station can offer to the model railroader. No wonder this fascinating rail-marine freight terminal in the Bronx, NY, caught my eye. Since my childhood, space availability have been the major obstacle to my model railroading ambitions. I've always been living in cottages with steeped roof and damp basements, keeping my dreams thightly contained on a 4'x4' plywood sheet. Large railroad empires quicky bore me to death. Furthermore, I'm quite the bipolar type modeller you encounter frequently in this hobby. I mean, I can deploy extravagant amounts of energy in a short lap of time, then fell absorbed quickly by another endeavour the following week, day or hour... With a small layout, there's more chance I'll complete things accordingly. Roughly 487 feet by 350 feet, the entire property can be reproduced at full-size in HO scale on a 6 feet by 5 feet layout with track radius around 14 inches. For this reason, Harlem Station is the perfect deal for me, small enough to fit my available space but full of personality. This small freight terminal operated from 1927 to 1969 on the shore of Harlem River. It was the most spartan rail terminal built in the Bronx, far less glamour than the CNJ Bronx Terminal. You can find plenty of informations about it at http://members.trainweb.com/bedt/indloco/errhs.html. This interesting website is my main reference for this project.